You are currently browsing the category archive for the ‘Commercial films’ category. This war time educational short tells us about public enemy no. 1. This turns out not to be Nazi Germany or Japan, but the Anopheles mosquito, which spreads malaria. The film is quite insightful in how malaria is spread and how one can prepare oneself against it. The film features the seven dwarfs from ‘Snow White and the Seven Dwarfs’ (1937) as volunteers to give an example. Their precautionary actions are staged to an instrumental version of the song ‘Whistle While You Work’, which was originally associated with Snow White and some forest animals doing the household in ‘Snow White and the Seven Dwarfs’ (1937). It’s a bit surreal to watch these happy-go-lucky fairy tale characters fighting a serious disease in a modern (South) American environment. Especially because some of the precautionary methods against malaria are quite disturbing. They include spraying oil on ponds and the use of the poisonous gas Paris Green, methods with devastating results for the environment. Clearly, environmentalism was not yet on the agenda in the 1940s (in fact, it only hit the political agenda after the publishing of Rachel Carson’s book ‘Silent Spring’ in 1962). The seven dwarfs were used earlier in the war propaganda short ‘7 Wise Dwarfs‘ (1941), but that consisted mainly of reused material. ‘The Winged Scourge’ has entirely new animation on the seven dwarfs. It was the last film to feature these happy little men. ‘The Winged Scourge’ was made for the Office of the Coordinator of Inter-American Affairs. It’s the first of a few educational health shorts made especially for the Latin American countries, other examples being ‘Defense Against Invasion‘ (1943), ‘Cleanliness Brings Health’ (1945), ‘What Is Disease’ (1945), and ‘Planning for Good Eating’ (1946). ‘The Grain that Built a Hemisphere’ is a war time educational short about corn in quite a propagandistic fashion. The Disney studios made it “under the auspices of the Office of the Coordinator of Inter-American Affairs”, which means that it belongs to the ca. 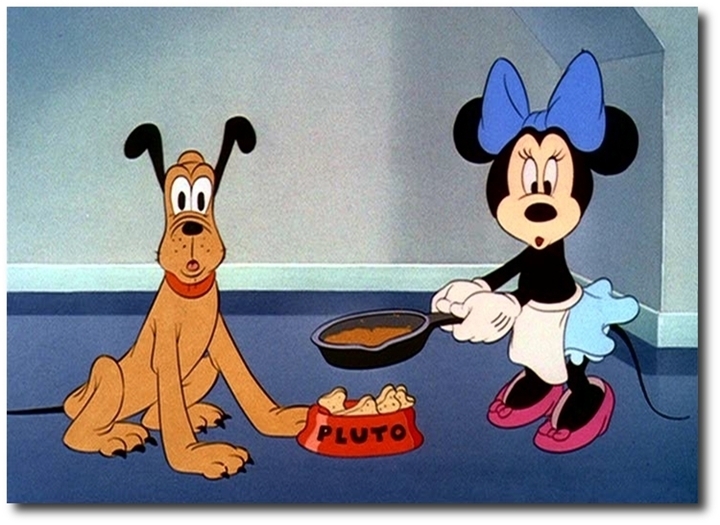 ten films Disney made in the context of America’s ‘good-neighbor policy’ . 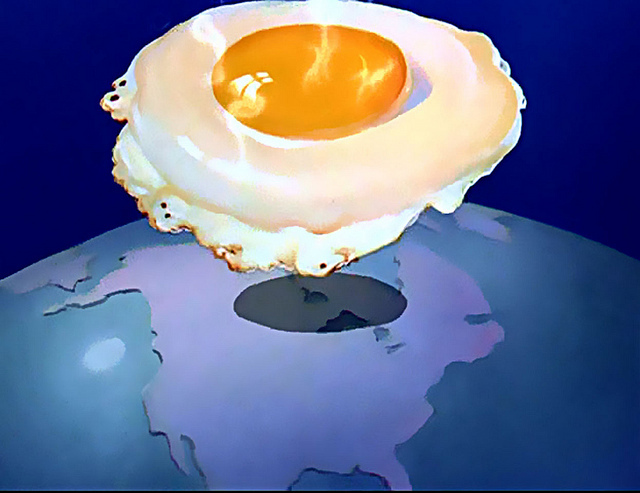 ‘The Grain that Built a Hemisphere’ is the most propagandistic of the lot. Its tone is set right away when the narrator pompously boosts that “corn is the symbol of a spirit that links the Americas in a common bond of union and solidarity”. 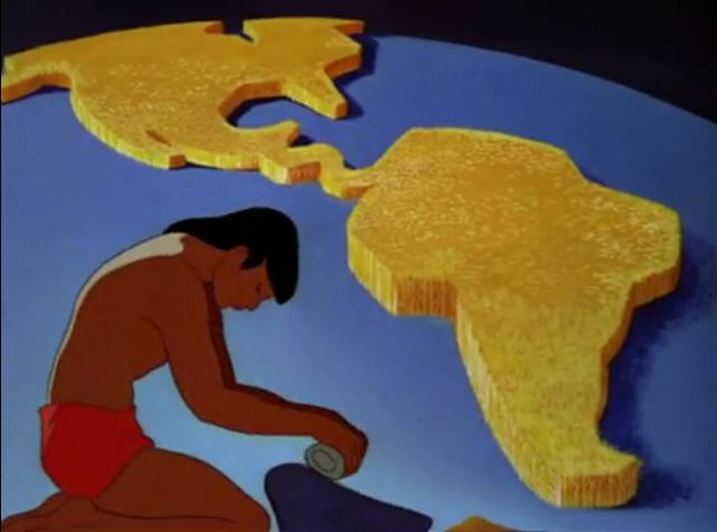 ‘All Together’ is the last and the shortest of the four propaganda films Disney made for the Canadian government. In the first half we only see some Disney stars parading on patriotic march music in front of the Canadian parliament building in Ottawa. This short scene reuses animation from ‘Pinocchio‘ (Pinocchio, Geppetto and Figaro), ‘Good Scouts‘ (Donald and his nephews), ‘Bone Trouble‘ (Pluto), ‘The Band Concert‘ (Mickey and the gang), ‘Mickey’s Amateurs‘ (Goofy) and ‘Snow White and the Seven Dwarfs’ (the seven dwarfs, who are clearly singing and whistling, although their voices are not heard). 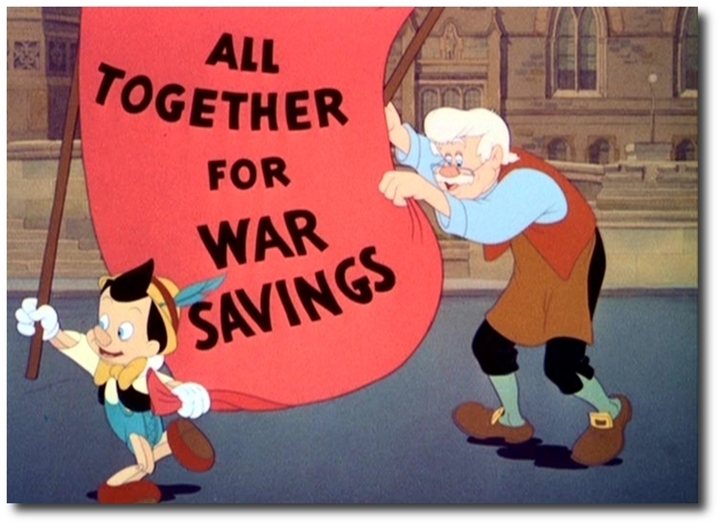 ‘All Together’ is the only propaganda short to feature Pinocchio stars. 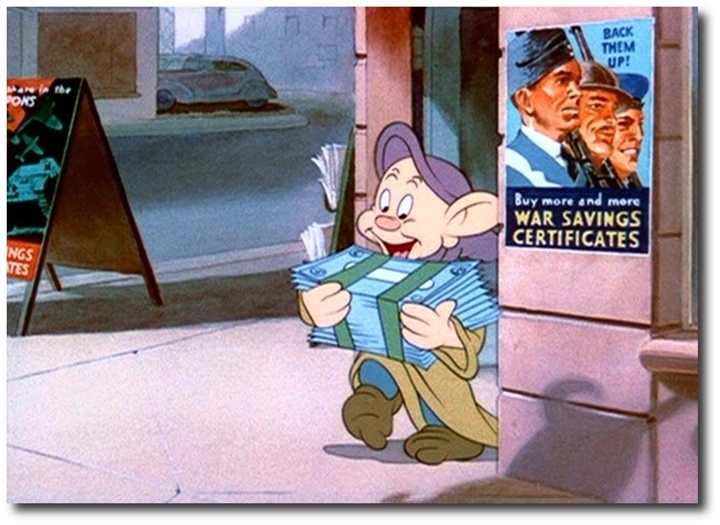 The second half uses powerful imaginary to persuade the public to buy war certificates. Of the new images, the most striking is the one of coins marching with bayonets. ‘All Together’ is image only. It doesn’t feature any kind of story, making it the least interesting of the four Canadian propaganda films. 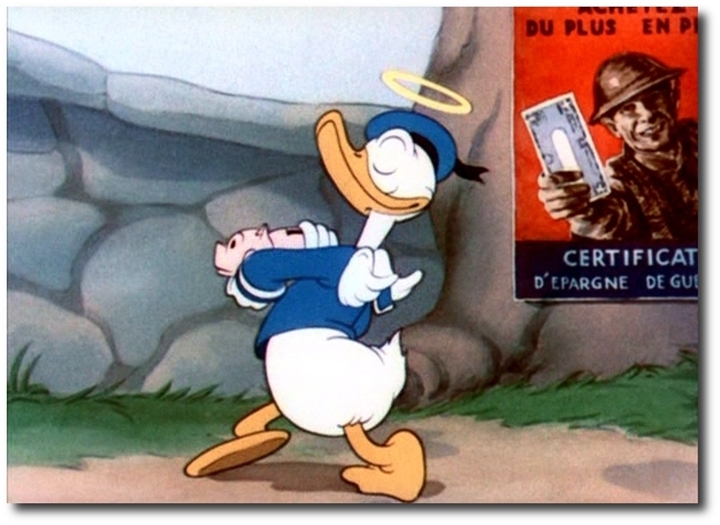 ‘Donald’s Decision is Walt Disney’s third short to persuade the Canadian public to buy war certificates. 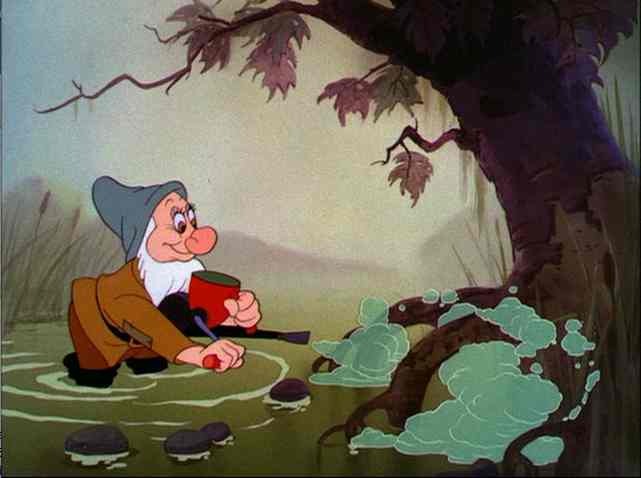 This film has the same two-part formula as ‘The Thrifty Pig‘ and ‘7 Wise Dwarfs‘ from 1941. The first half combines reused footage from two Donald Duck shorts from 1938: ‘Self Control‘ and ‘Donald’s Better Self‘, but with altered voices. The second half resembles that of ‘The Thrifty Pig‘ and ‘7 Wise Dwarfs‘. The result is less convincing than in the earlier two cartoons, probably because the source material is weaker. Neither ‘Self Control’ nor ‘Donald’s Better Self’ belong to Donald Duck’s best. Besides, Donald only reluctantly does his part, in great contrast to the optimistic pigs and dwarfs from the earlier shorts. 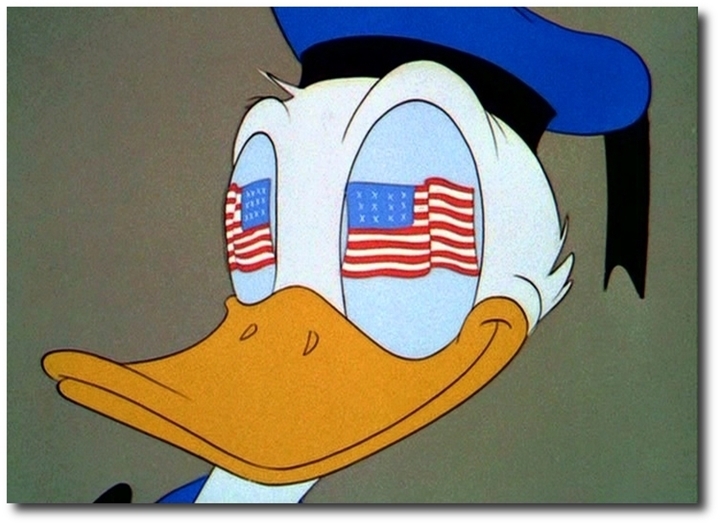 Indeed, when Disney had to convince the American public for government purposes, the studio came up with completely new animation for its biggest star (in ‘The New Spirit‘ and ‘The Spirit of ’43‘). ‘7 Wise Dwarfs’ is Walt Disney’s second propaganda film for the Canadian government, and it uses the same two-part formula as the first (‘The Thrifty Pig‘), this time reusing animation from Walt Disney’s most famous film of all: ‘Snow White and the Seven Dwarfs’ (1937). The first part of ‘7 Wise Dwarfs’ reuses animation of the seven dwarfs singing the mining song and ‘Hi-ho’, but with altered lyrics and backgrounds. There is some new animation of the Dwarfs entering and leaving the bank to buy war bonds. The second part is almost the same as that of ‘The Thrifty Pig’, ending with the same powerful image of planes gunning the words ‘Invest in Victory’. The Seven Dwarfs would return in ‘The Winged Scourge‘ (1943), which features a lot of new animation on them. 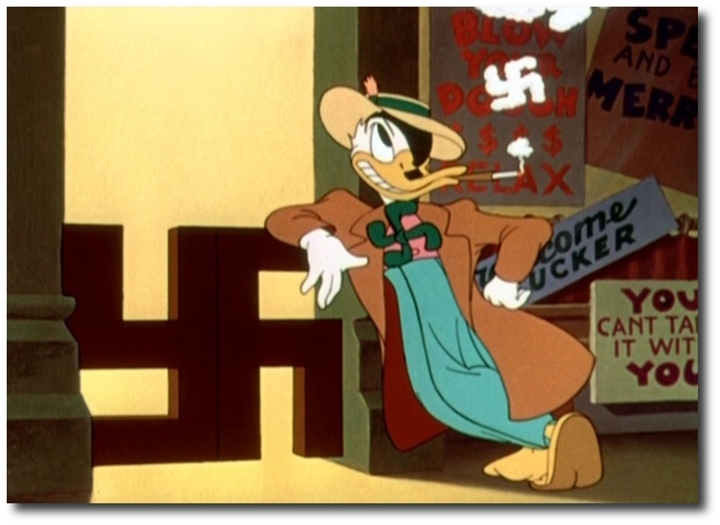 Before The United States were dragged into the war by Japan’s attack on Pearl harbor, December 7, 1941, Walt Disney Studio already had made four propaganda shorts for the Canadian government. Canada, had declared war on Nazi Germany on September 10, 1939, a week after the United Kingdom, following Germany’s invasion of Poland, September 1. ‘The Thrifty Pig’ is the first of Disney’s four propaganda films commissioned by the Canadian government to persuade their citizens to buy war bonds to invest in the war effort. The other three being ‘7 Wise Dwarfs‘ (1941), ‘Donald’s Decision‘ (1942) and ‘All Together‘ (1942). It’s also Disney’s first propaganda cartoon. 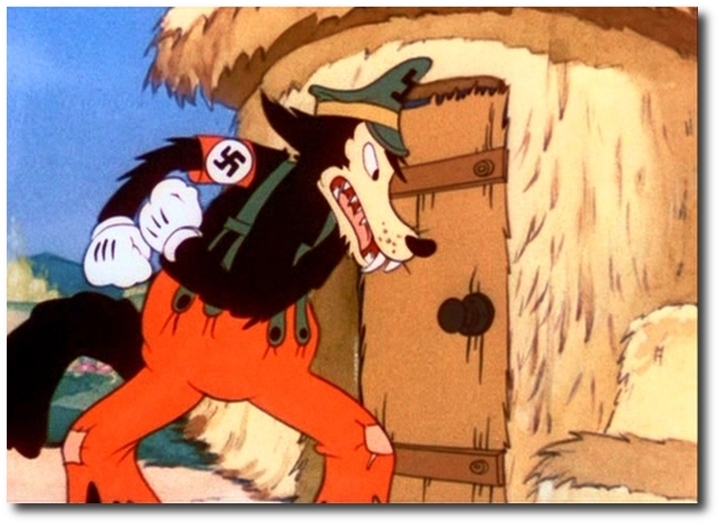 ‘The Thrifty pig’ consists of two parts, The first part cleverly reuses animation from Walt Disney’s most famous short, ‘Three Little Pigs‘ (1933), but in this shortened version the wolf wears a Nazi costume, the bricks are made of war bonds and the union jack is waving at the wise pig’s house. The only new animation is when the wolf’s blows reveal war bonds beneath the plaster and when the wise pig says “these bricks not only stop his blowing, they will also get him going”. 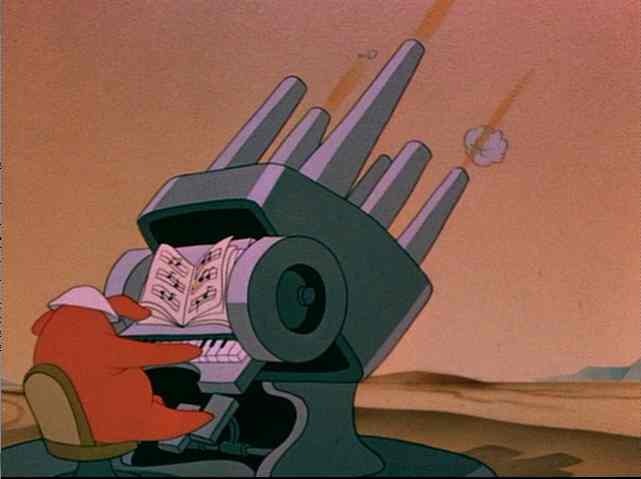 The second part is more overtly propagandistic and uses limited animation of war machines and slogans to persuade the public to buy “more and more war certificates”. The end shot, where a plane shoots the words ‘Invest in Victory’ on the screen’ is the most powerful image of the complete film. This two part formula would be reused in all succeeding propaganda films that had to persuade the public to invest in the governmental war industry. Apart from the Canadian commissions, we see this structure in ‘The New Spirit‘ (1942) and ‘The Spirit of ’43‘ (1943), which had to persuade American citizens to pay their income taxes in time.